Kopan Monastery was founded by Lama Yeshe and Lama Zopa Rinpoche in the early Seventies to create a haven for monks and nuns from around the Himalayan region. Kopan, located on a hill in the Katmandu valley is a thriving community of 600 monks and 200 nuns today. 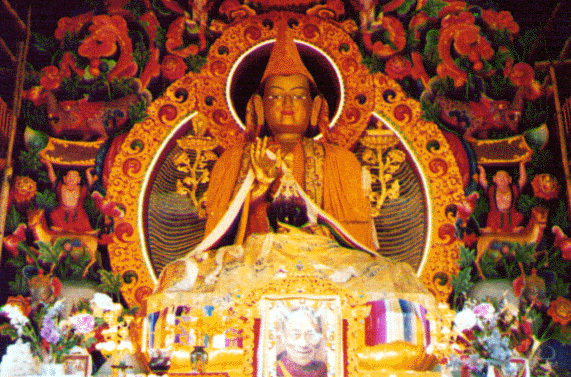 Above: The gentle, popular and much loved Lama Lhundrup is the Abbot of Kopan Monastery. Lama is always smiling. 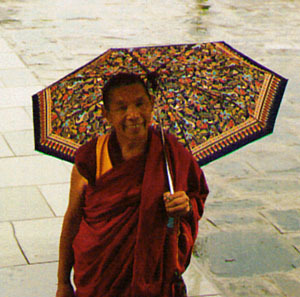 I have never seen Lama not smiling and he truly must be the kindest lama ever. The Lamas also introduced Buddhist Meditation Courses at Kopan for lay people in search of teachings. These have been enthusiastically described as a life changing and peerless experience. Today, the month long Lam Rim Meditation Course at Kopan continues to be held each year. And Rinpoche continues to teach at this course every year. Those wanting to attend these Mediation courses should click here. Kopan is Rinpoche’s monastery. It nestles above a small hill in the Katmandu valley of Nepal. On a clear day one can see the Himalayas in the distance, providing the support of the world’s highest mountain range for the monastery. Below us is the sprawling valley that makes up the bright hall, where auspicious and favourable chi settles and accumulates before making its way auspiciously up the meandering road to the monastery. Being in Kopan is like being in heaven. We wake up before dawn in the mornings to start the day’s meditations, and it is as we leave the large gompa (prayer hall) into the bracing mountain air that we see the sun rising on the horizon. There is a magical silence all around us, and carpets of clouds nudge at our feet. It is like being in Pure land … Tushita, Shambala, Potala, Shangri la …. Each day the sun casts its light in different ways, sometimes bringing small flowers into sharp focus and at other times, sending tiny slivers of light that highlight the tops of trees that seem to have grown out of the mists. The energy of Kopan is pure and exquisitely beautiful, so pure it overwhelms one’s senses completely. "The Pujas at Kopan are amazingly moving occasions especially the long life Pujas held for Lama Zopa Rinpoche at the end of the Kopan Meditation Course. 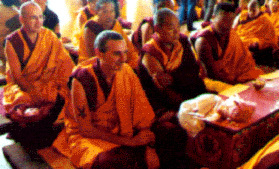 The whole monastery participates in these Pujas and usually many of Rinpoches lay students from around the region also come and pay Him homage. Pujas are Ritual Offerings where the most beautiful prayers are chanted in Tibetan by the monks and these are followed by elaborate Ritual Offerings that can be very breathtakingly moving. I participated once in the long Offering procession at Kopan, and was surprised to feel sincerely moved by the ritual. I remember that from somewhere inside me some kind of strange emotion welled up as I offered Rinpoche one of the Ritual Offerings. Later I realized it was a feeling of devotion and great gratitude that he had actually allowed me to meet Him in this life ... I have never ceased being amazed that in the midst of the twentieth century and going into the new millennium, we are actually seeing amongst us such holy holy Beings ... it is truly amazing ... "